What a "sweet" collection of recipes! See some I'll have to give a try. Thank you Carol, This is such a great way to serve upside down cake! So clever! Thank you Ellen for your wonderful recipes, keep them coming! Nancy I am so honored that you chose 2 of my favorite cupcake recipes to be in your beautiful collection of cupcakes. Thanks so much. These are all winners and they really sound delicious. Thanks again. 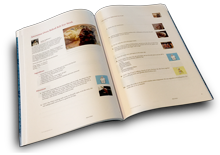 Thank you, Nancy, once again for including two of my recipes in your cookbook--I am honored!